" Every Vote Matters in MN's U.S. Senate Hand-Count. Every. Single. One.	" Every Vote Matters in MN's U.S. Senate Hand-Count. Every. Single. One. UPDATE at end of article. Math/statistics/poll-wiz Nate Silver at FiveThirtyEight.com predicts the race between incumbent MN Sen. Norm Coleman (R) and challenger Al Franken (D) could result in a 27 vote win for Franken. That's right, just 27 votes. According to the secretary of state's website, 1,074 people in Clay County voted on Election Day but only 1,069 ballots were produced by the county for the recount. In St. Louis County, 1,649 people voted on Election Day but the county turned over 1,646 ballots for the recount. And in Washington County, 1,464 voted on Election Day but 1,449 ballots were turned over for the recount. The shortfall can easily shift the election to Franken or Coleman's favor because the race between the candidates is so close. That in mind, we'll take the opportunity to remind both parties in the recount of our earlier suggestion that they make public records requests (if they haven't already) for the invoices from printers of all of the original ballots, and then request that all ballots --- including unvoted ballots --- be counted as part of the final reconciliation of ballots. The number of voted, spoiled, and unvoted ballots should be exactly equal to the number of ballots shown as printed originally on those invoices. If not, there's a problem. Franken's team has been fighting for the information of voters whose absentee ballots were rejected for one reason or another, charging that they should be included in the current "recount." Or, at least in the alternative, they should be allowed the information on those voters so they can double-check to make sure the ballots --- some rejected because the signatures were believed not to match the voters' registration forms --- were legitimately rejected. As San Diego election attorney Ken Karan noted via email, in regard to absentee ballots that were tossed out due to perceived signature mismatches in an ongoing challenged election in California, the onus ought to be on election officials to prove that these are, in fact, illegally cast ballots. If so, then there need to be voter fraud investigations and/or prosecutions for all of them. They are either legal ballots, or unlawful forgeries, and should result in prosecutions. "It should not be as simple to discard a ballot because the signatures don't match after a subjective comparison of signatures by people without any recognized expertise in the recognition of handwriting," Karan wrote. "Furthermore, if the signatures don't match, then that should mean that someone is trying to vote someone else's ballot. Now, that is voter fraud. Every questionable ballot should either be verified with the voter whose registration signature is at issue, or it should be the subject of a criminal prosecution." The practice of tossing out ballots based on signature mismatches, without recourse for the voter --- for example, notifying them, and allowing them to confirm that it was their ballot, and they are who they said they were --- needs to stop. We've got a bum right wrist these days (blogging injury) and believe our signature, right now, would not likely match our signature from 10 years ago, or so, when we originally registered to vote in California. We'd be pretty ticked off if our vote was not allowed to count on that basis! Yet, ballots are routinely discarded in this manner, and likely, thousands of legal voters disenfranchised in the bargain. We've been noting the rapidly increasing number of challenged ballots by both campaigns. Nate Silver, who noted that Coleman's challenges suddenly increased exponentially as of Day 4 of hand-counting, believes that there are likely more legitimate challenges in the Franken stack than in the Coleman stack, and those ballots --- counted by the state Canvassing Board after the initial hand count is concluded --- will likely determine the race. On the heels of our coverage of that issue yesterday, which noted that Coleman now seems to be making ridiculous challenges at this point --- e.g., ballots showing votes for McCain and for Franken, or for nobody at all in the Senate race, must have been voter error --- several have suggested that Coleman's challenges may be part of a scheme to keep his "lead" from the original machine tabulated count in place. The strategy would allow Coleman the (cynical) PR advantage of being able to claim: "We won the original count! And we won the recount!" That misleading claim will be made loudly across the entire Republican echo-chamber (which, shamefully, includes your public airwaves on talk radio, 24/7) and will be followed quickly with: "Don't let leftist, MoveOn.org-supported, Democrat Sec. of State Mark Ritchie thwart the will of the people and steal the election for Al Franken with his hand-picked State Canvassing Board!" While an absurd case to make, hey, it worked for George W. Bush in 2000 when the GOP claimed "He won the first count, he won the recount, he won the second recount, etc." Never mind that none of those counts were ever completed, or even carried out as per state law, the Bush team was more than happy to go all the way to the U.S. Supreme Court making that case, and that their client would be "irreparably harmed" if all ballots were allowed to be counted, since the media had already announced him as the "winner." On that score, we'll take the opportunity to mention that had all of the ballots been allowed to have been counted in the state of Florida in 2000, Al Gore would have been the winner [PDF]. Receiving the most votes is beside the point for the GOP, however. They have proven themselves willing to do anything to win. If you have any question about that, go see their shameful, official "Minnesota Recount" website where they have been claiming for weeks that Franken and the Democrats are "stealing the election." The official website of the National Republican Senatorial Committee (NRSC) has been unabashedly making that case, for weeks, without any actual evidence to support their ridiculous claim. But who cares. Anything to "win" for those guys, apparently. "And now they have photographic evidence of one of those missing ballots, stuck under a voting machine in Hennepin County. The picture was snapped by one of Franken's recount observers." Check it out here. « PREVIOUS STORY "'Document Hold' Served by OH Attorney to GA SoS in Advance of State's U.S. Senate Run-off Election"
"Every Vote Matters in MN's U.S. Senate Hand-Count. Every. Single. One." If you want a real redux of the Florida 2000, it is that the Franken team doesn't seem to be looking at the votes NEVER COUNTED IN THE FIRST PLACE (except for absentee). I can guess that if the average of 3-5% holds true, there are upwards of 90,000 votes that are waiting to be counted, and I'm betting that they would swing for Franken 65-35%. Why? Becausea traditionally, spoiled and voided ballots are Democratic ballots and POOR people ballots. If the Franken team is making the same mistake that Gore made and just looking at the UNDERCOUNT, then they DESERVE TO BE CHEATED, plain and simple. If, after 8 years and multiple books by brilliant minds like Marc Crispin Miller and Greg Pallast and Steve Friedman and Fitrakis/Wasserman (please excuse my spelling) and others, the Franken team still doesn't GET it, then they don't deserve a U.S. Senate seat. And yet, I have not heard a single word about the TENS OF THOUSANDS of voided and spoiled ballots that we KNOW are out there, and will be discussed six months or a year from now when this piddling little vote-by-vote argument has been put to bed. Just called the Franken HQ and Coleman's margin is reduced to 84 votes as of 20 minutes ago, this includes challanged ballots. They have filed a request to see the rejected ballots but this is in the hands of the court to decide and with the Thanksgiving holiday, the courts may take awhile to make a decision about giving access to the actual physical ballots that have been "spoiled" or "rejected". There remains 20% of the votes to be counted by hand for the recount, this will probably be done by Monday at the latest. The race boils down to which ballots get counted, and how they get counted. No one knows exactly how many ballots are spoiled and haven't been counted. 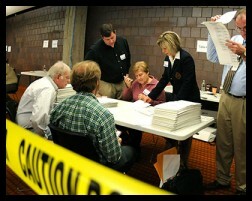 there are alot of unknowns in this recount. Thanks 'john harris' for that info. I also think those spoiled and rejected ballots are crucial to this race (and probably races all across the country that we'll never know about) and need to be revisited. I hope they demand to see those ballots and make appropriate challenges to their invalidation through as many levels of court revie as necessary. Very interesting report, Brad. Ken Karan's point is so well taken. If I weren't chary about the need to dot I's and cross T's on provisionals, I would say that such voters should be allowed to vote provisionally and a mechanism for providing supporting evidence of their signature change should be created. I do think there is a space between "I am trying to do my job right and I really can't recognize this signature as a match," and "this is clearly NOT the person." Creating a way forward to close that gap would be a good thing. Many of our laws and regulations depend at the end of the day on the common sense (or not) and good judgment (or not) of those in charge of our polling places. A rejected signature in one place is not the same signature necessarily that would be rejected in another --- probably we should not leave it so completely to idiosyncratic or arbitrary, untrained judgments. Arbitrary signature verification should be eliminated as a means of "balancing" turnout in an election. Signature verification does serve a purpose and imho should not be thrown out (I have visions of a group of undocumented day workers coming in for their day's assignment: to rev up votes for a particular candidate or party). Regarding the case of Coleman/Franken and the repeated "just a few ballots missing" from precinct to precinct: in Ohio, wasn't the number of votes per precinct that would have changed the outcome of the election for Kerry something like two? The assumption is that the ballots are missing and not that e.g. the machines were programmed incorrectly. It would be interesting to know if the areas in question were all working from the same ballot design (i.e. no differences in local races) or whether there is a variety of ballots (and therefore programming, I think). If they were all the same, then examining whether other locations with identical ballots had any discrepancy would be interesting. It would also be interesting to look at Minnesota's past audit results overall and for those particular locations to see if there is a past pattern of losing similar amounts of ballots. I know of no mechanical flaw or problem that would lead to extra votes being shown as cast (do you?). I am assuming that the pollbook showing voters checked in correlates with the machine tape plus hand counted ballots total rather than the total from the latest all-hand count, right? I am not real comfortable with ballots "found" as an election goes on --- it raises questions about the quality of controls in the precinct where they were lost in the first place. I guess the final area I would ask about is whether Minnesota has a set counting protocol or whether each location invents its own. If the latter, what is their method? If the method does not allow for two pairs of eyes to examine each ballot and how it is recorded, then there may be some vulnerabilities to inaccuracy in how they hand counted. I know Minnesota has done a great deal of work to update and fill out their statutes, regulations, and processes --- more than many other states, to be sure. It is events like this close race that let everyone figure out where things are working and where they can be developed further. IMHO, elections that breathe --- in which the people continue to examine, question, and provide citizen oversight --- are vital to democracy and CAN help create the best system there can be (if someone is listening and responding with appropriate changes to law/regulations/procedures). Elections where nobody looks, nobody questions, and nobody challenges are the kind that I think can spawn wrongdoing. Minnesota can only get better as a result of any lessons that may be unearthed and learned in this election recount. One more factor in the signature verification issue: challenges to absentee ballots or challenges of voters at the polls. It is not just the election official --- it is handling a challenge with a set of tools that lets both parties agree how a challenge may be made and what steps can be taken to counter it. A challenge may be arbitrary or seem that way --- but the response cannot also seem arbitrary. Finally, the idea of getting the info on the printed ballot total and reconciling would need to be done via an FOI as an independent procedure. If you read Minnesota's recount laws, it is specifically defined as a plain vanilla recount rather than as an investigation into any aspect of procedure. the losing candidate, to satisfy themselves that ballots were, in fact, counted properly in a close race. changed by these adjustments, but it does happen. See page 6 for this text. "It is simply to physically recount the ballots for this race!" Ballots that were determined to be SPOILED or VOIDED would not have been counted in the first place, and therefor would not be subject to a "recount" unter the above. Franken will get just what he deserves (cheated out of a Senate seat) because he didn't support and promote the Election Reform movement in 2004 when it mattered. "Franken will get just what he deserves (cheated out of a Senate seat) because he didn't support and promote the Election Reform movement in 2004 when it mattered." When votes are not accurately counted, it isn't just the candidate who loses, but democracy itself. When the 2000 election was stolen, it was not simply Al Gore who lost but Americans, and indeed, the world which suffered the consequences.